Berencana ke TMII langsung aja menginap di hotel santika. Kini kamu bisa menikmati diskon langsung hingga 20% dengan menginap 2 malam di Hotel santika. 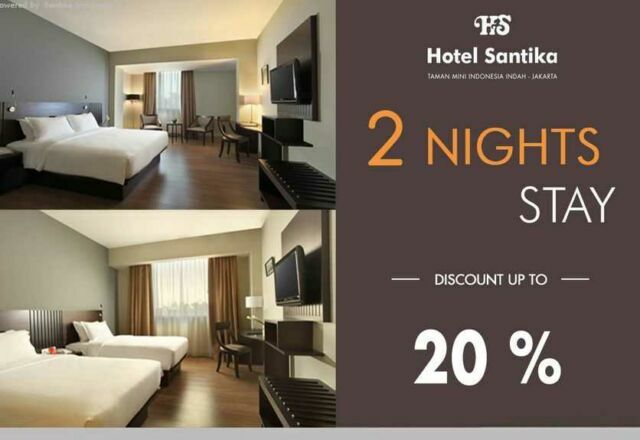 Promo Hotel Santika TMII ini berlaku tanggal 22-23 Oktober 2014. The booking can be cancelled. In case of no show, you will be charge one night. Untuk melakukan pemesanan silahkan ke halaman reservasi hotel santika tmii ini. With a full range of room and bathroom amenities with a shower and careful attention given to the little touches, each room exudes that quiet comfort. The Superior room is 26 sqm, and is equipped with air-conditioning, satellite television, tea/coffee-maker facilities,complimentary bottled water, room completed with electronic smoke detector and complimentary daily newspaper, free parking, free WiFi 24 hours in rooms, 24 hour room service.